Marriott Vacations expects its revenues to be negatively impacted by about $16 to $20 million as a result of Hurricane Irma. According to its assessments, it sees Irma's impact on full year net income of about $6 to $8 million. All of Marriott Vacations affected resorts and sales centres have reopened, either fully or partially, except for two resorts and sales center on St. Thomas and one resort and sales center in three locations in Florida. British police are investigating a suspicious package near London's Holborn underground tube station, according to Reuters. U.S. housing starts fall 0.8 percent in August. That's compared to a fall of 2.2 percent in July. The unit rate of housing starts is 1.18 million. Housing permits grew 5.7 percent in August versus a fall of 3.5 percent in July. The unit rate was 1.3 million. 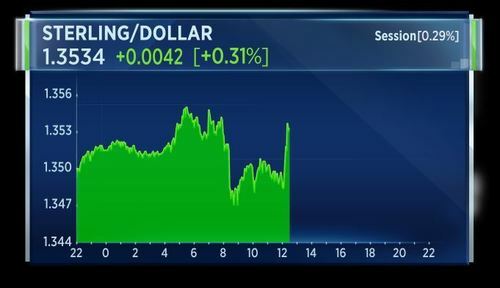 Sterling has jumped half a cent after U.K. newspaper The Telegraph reports foreign secretary Boris Johnson will resign before the weekend if the prime minister opposes his Brexit demands. U.S. August import prices rose 0.6 percent on the month, compared to the consensus expectation of 0.5 percent. Petroleum import prices rose 4.8 percent. 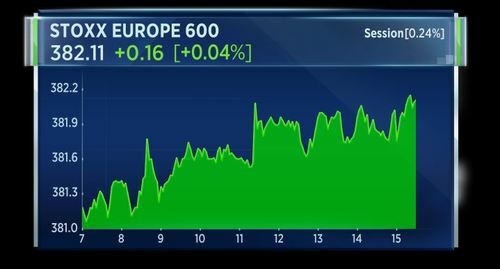 Following the latest import price and housing permit data, U.S. stock market futures are extending gains and look set for a higher open. British police are standing down after a false alarm near a London tube station, according to Reuters citing a spokeswoman. Police were investigating a suspicious package near Holborn underground station. Neogen reports a 21 percent increase in net income. The company reports Q1 earnings per share of 31 cents, matching the IBES view. Revenue was $95.26 million, beating the IBES view of $94.8 million. Net income was $11.9 million. The British foreign office says it has no immediate comment on The Telegraph report that foreign secretary Boris Johnson will resign by the weekend if the prime minister does not change her stance on Brexit. The U.S. "Redbook" is out. Retail sales for the first 3 weeks of September are up 0.1 percent versus August and 4.1 percent versus September last week. Retail sales are up 3.6 percent for the week ending September 16 versus a year ago. City of London Police says Leadenhall Market has been evacuated due to a suspect package. Police are advising the public to avoid the area. 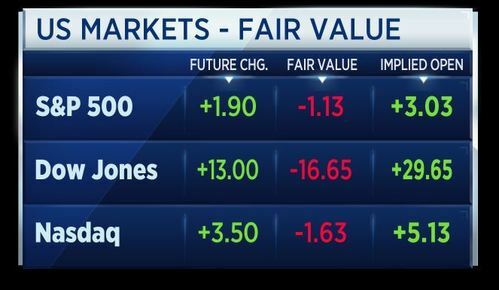 U.S. markets open higher on Tuesday as investors look ahead to the Fed meeting. London police says Leadenhall Market has reopened after briefly being evacuated on concerns regarding a suspect package. 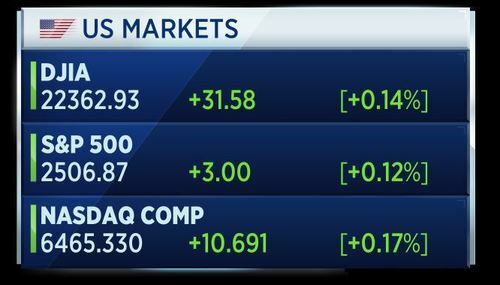 The Dow Jones has hit a record high ahead of the next Federal Reserve meeting and a speech by President Trump scheduled for 10 a.m. 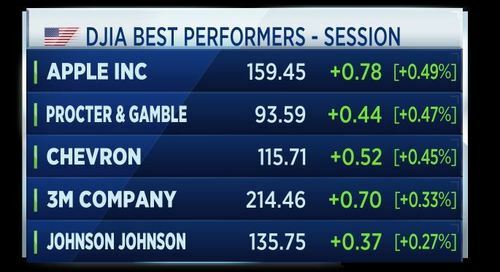 Here are the top and bottom stocks on the Dow Jones index. Fitch says QE and world growth buoy its global ratings outlook. The rating agency's outlooks remain on an improving trend and, on balance, are less negative than at the start of the year across most rating sectors. Risks to this outlook include political instability and corruption in Latin America, especially Brazil, as well as U.S. policy uncertainty and the potential for trade protectionism to develop. Housing starts hit an annual rate of 1.18 million in August, down from 1.19 in July, according to the latest data released earlier today. Housing starts were close to expectations, according to Jim O'Sullivan, chief U.S. economist at High Frequency Economics. Starts were fairly close to expectation, while permits were much stronger, led by the especially volatile multifamily sector. Through the volatility, starts and permits have continued to move up this year, albeit modestly and with some signs of cooling in the latest homebuilder survey. Total starts have averaged a 1198K rate so far this year, up from an 1177K average last year. Permits have averaged a 1248K rate so far this year, up from 1207K last year. T-Mobile and Spring are in talks regarding a merger, according to sources. Speaking at the United Nations, Brazil's President Michel Temer says climate change cooperation cannot be delayed and says data shows deforestation in the Amazon has dropped 20 percent in the last year. Temer says the world must imrpove marcket access for agricultural goods and eliminate subsidies which distort trade. He also criticizes nationalism and says protectionism is no way to resolve economic difficulties. Temer adds that Brazil is overcoming an economic crisis and is restoring fiscal balance and economic credibility. President Trump is beginning his address to the United Nations. Trump says the U.S. has done very well since election day. He says companies are coming back to the U.S.
Trump says terrorists and extremists have gathered strength and spread to every corner of the planet. Trump says the United Nations is meeting at a time of "immense promise and great peril." He says the UN was founded on the principles of sovereignty security and prosperity. President Trump says success depends on a coalition of strong, independent nations. He says countries are expected to respect the interests of its own people and recognise the rights of every other sovereign nation. He says America does not seek to impose its way of life on any other nation, but provide an example. Trump is now praising the U.S. constitution. He says he was elected to give power to the American people. He says the U.S. government's first duty is to its people. He says he will always put American first, just as other leaders should put their own countries first. 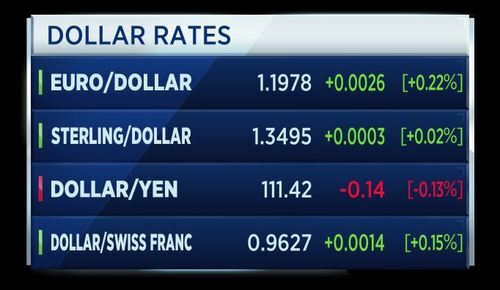 The dollar is trimming losses against other currencies as President Trump gives his speech to the UN. President Trump says the U.S. can no longer be taken advantage of, or enter into one-sided deals. President Trump says the U.S. will forever be a great friend to the world, and must protect its friends and their interests. He says the U.S. must uphold respect for law, borders and culture, and makes reference to Ukraine and the South China Sea. Trump says a small group of regimes do not uphold the principles of the UN. He says the righteous many must confront the evil few. He is now criticizing the North Korea. President Trump calls North Korea a depraved regime and calls the country's pursuit of nuclear weapons "reckless." He says it is an outrage that other nations would trade with North Korea. He calls the regime a "band of criminals." Trump says the U.S. is "ready, willing and able" to use force against North Korea, but calls for the United Nations to deal with the country peacefully. Trump thanks China, Russia and all involved in the recent UN sanctions against North Korea. He adds that if the U.S. is threatened, the U.S. will have no choice but to totally destroy North Korea. Trump is now criticising Iran and says it is using its wealth to arm terrorists, support Assad's regime in Syria and destabilise peace across the Middle East. He says the U.S. cannot support an agreement that provides cover for the eventual development of nuclear weapons. He says the Iran deal was one of the most one-sided the U.S. has ever entered. Trump says Iran must stop supporting terrorists and start respecting the sovereignty of its neighbours. Trump says the UN must stop radical Islamic terrorism and be driven out of our nations. President Trump says it is time to expose countries that support terror. He says the country has achieved more against ISIS in the last 8 months than it has in many years. Trump says the U.S. seeks the de-escalation of Syria conflict and political solution that honours the will of Syrian people. President Trump says uncontrolled migration is deeply unfair. He says the U.S. continues to lead the world in foreign aid. President Trump says major portions of the world are in conflict and are "going to hell", but says the UN can resolve these problems and hopes it will become a more transparent and effective organisation. He says the U.S. bears an unfair cost burden of funding the UN. President Trump says the situation in Venezula is "completely unacceptable" and the UN cannot stand by and watch. He says the Maduro government has brought a once-thriving nation to the brink of total collapse. He says the U.S. is prepared to take "further action" if Venezuelan government continues to impose authoritarian rule on its people and calls for the restoration of democracy. He says the problem in Venezuela is that "socialism has been faithfully implemented." and says from the Soviet Union to Cuba, where socialism has been faithfully implemented it has led to disaster. Trump says that for the UN to successfully face the challenges ahead it must listen to the past advice of President Truman. Trump says the "true question" for the UN and people of the world is "are we still patriots?" He asks do the people of the world love their country enough to protect them. Trump says the U.S. has been among the greatest forces for good in the history of the world and calls for a "great reawakening" of nations' pride and people. Trump decries multinational trade deals and institutions and accuses others of gaming the system and breaking the rules. The president has now finished his speech. 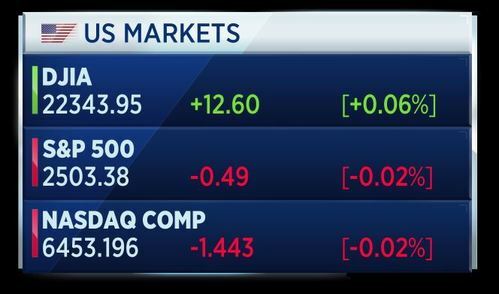 U.S. markets turn flat after initial gains at the open. KPMG has issued an apology for what went wrong at its South Africa unit. The company cleared out the leadership at the unit and announced a set of governance reforms after it emerged that work done for firms belonging to the Gupta family "fell considerably short" of its standards. KPMG said an investigation found several failing in the report prepared for the South African Revenue Service. KPMG has appointed a new CEO for the South Africa unit and plans to further "strengthen monitoring of which clients we choose to work with and how we handle sensitive client engagements. 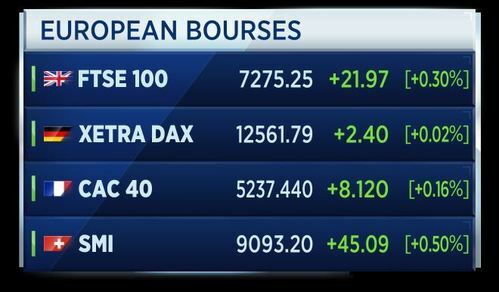 European markets are now closed, with the Stoxx 600 finishing the session flat, up just 0.04 percent. 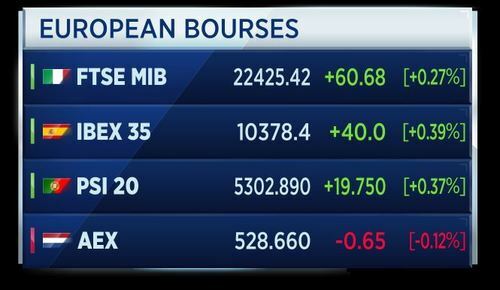 Here are the European markets and how they finished Tuesday's session. We'll close the blog there. 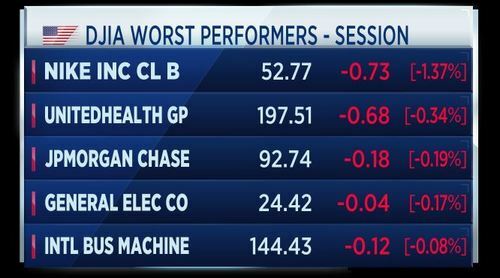 Join us again tomorrow for more market coverage and the latest breaking news.